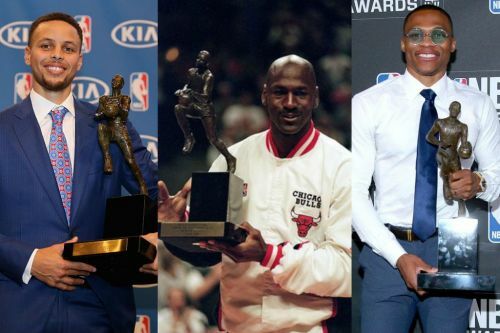 Which MVP season in NBA history will be No. 1? There isn't a specific definition for this award, at least in the NBA, in terms of parameters and so on but that's what makes the debate so interesting and captivating each season. Each year, the storylines and narratives differ for every candidate, making the race an interesting one. Now, for some historical facts. The award was first given out in 1956 when it was awarded to Bob Pettit of the St. Louis Hawks. Initially, MVP awards were voted for by fellow players in the league but from 1979-80 onwards the voters became a panel of sportswriters and broadcasters from the United States and Canada. Kareem Abdul-Jabbar has the most number of MVP awards in league history with six. Not far behind with five MVP's are a couple of players - Michael Jordan and Bill Russell. And tied for four career MVP's are two players - LeBron James and Wilt Chamberlain. 2) Team record. This shows the impact of the player's great season on the team's performance that year. 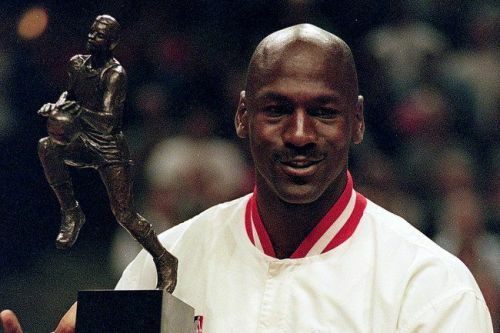 Michael Jordan named the league MVP in 1996. You won't see many All-Time NBA lists without the name Michael Jordan being thrown around, most probably at the top of the list. This time around, he tip-off the list at No. 10. Everything went right for Jordan this season. He won the league MVP, was named the All-Star Game MVP, his team the Chicago Bulls won a then-record 72 games in the regular season and he went on to win his fourth championship, in the process also receiving his fourth Finals MVP Award. And we haven't even mentioned the fact that this was his first full season, coming off of a two-year hiatus playing minor-league baseball. Yet, he dominated the league just like he had before he left it. Other than leading the league in points per game and total points, he also led the league in Win-Shares (20.4, 7th all-time among MVP seasons), Player Efficiency Rating (PER) and Usage percentage. His Win Share per 48 minutes of .317 also ranks sixth all-time among other MVP's. A huge reason why this MVP season of Jordan's ranks at 10 is because he had a lot of support on his team in Scottie Pippen, Dennis Rodman, and a more-than-capable bench. Not to mention the fact that the talent level of the teams in the league had diluted with more than a couple expansion teams.